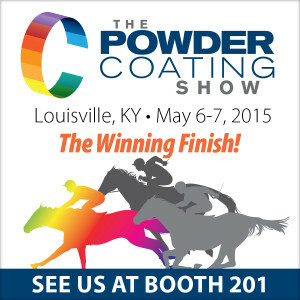 The Powder Coating Show 2015 is the ultimate learning experience. The 2015 show is in Louisville, KY, May 6-7. The show offers educational sessions and the chance to talk to industry experts. Download your FREE Guest Pass so you can join as at Booth 201. Quick installation. Approximately half the time to install compared to a traditional system. Scalable. React to market conditions by expanding or contracting your workload. Flexible. Handle a variety of sizes of parts with diverse finishing recipes efficiently. From design to install, IntelliFinishing provides a turnkey installation that is focused on quality and efficiency for your automated finishing system. Why use 40-year-old technology in your new paint system? Why Use Old Technology on a New Finishing System? Are you still using old technology when painting parts? We invite you to take a look at some of the new technology that is out there and apply the benefits it can bring to your particular situation! 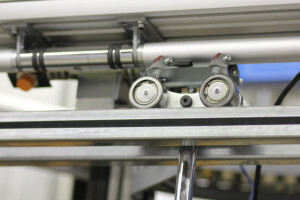 Visit www.intellifinishing.com where you can take a look at what new technology has to offer when you require a turnkey liquid paint system, powder coating system or an automated paint system. IntelliFinishing Complete Paint Systems are an exciting alternative to power and free systems. We want to share with you a few of the advantages you can expect when replacing your traditional power and free or monorail systems with the newest technology for industrial paint system replacement. One of the benefits that our customers and potential customers talk a lot about is the amount of floor space that can be saved. In some cases, as much as 43%. By eliminating bulb turns, shuttles used in new technology can decrease your footprint exponentially, which can add up to thousands of dollars of savings. If you are processing large parts, our shuttle demo should move to the top of your “to-do list” right now. Our industrial paint systems are “chain free”. (They are also awesome). No chain means no extra space is needed for the return chain as in a power & free system. Awesome because, your footprint just got smaller again! On this same note, no chain means the ability to reverse – AND – no messy oil dripping on your parts or collecting dust. Another cost-saving benefit, especially for large manufacturing companies, could come in the form of dollars spent supplying employees with hearing protection. One of our customer’s finishing systems is less than 75db, which resulted in the removal of employees from a hearing conservation program. Being a “no chain” system means no dogs or buffer zones, and that equates to: no metal carriers crashing into each other, further reducing noise. A turnkey powder coating system provided by IntelliFinishing makes part sway a thing of the past! 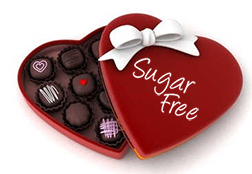 New technology with variable frequency drives (VFD) controls the conveyor’s motion, and Smart Controls allow for variable speeds and independently controlled zones for different recipes. New technology gives you the ability to monitor and track parts at ANY point in the system. (Seriously, you need to take a look at one of our demos of an automated powder coating system). With the new technology used in an IntelliFinishing complete finishing system, the conveyor runs only when the carrier is present. Additionally, the supporting process equipment, like a washer, also only runs when a part is present. We all intend for our business to grow. 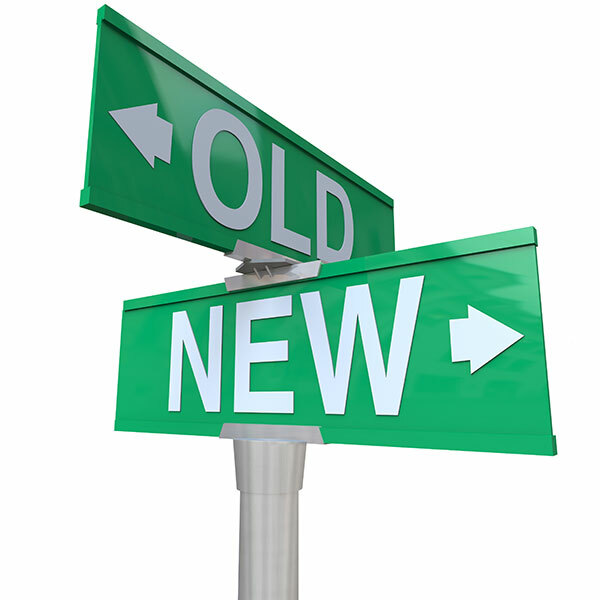 Will your “old” technology grow with you? Our “new” technology will. 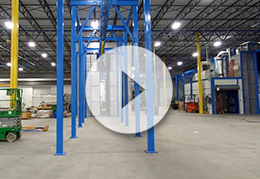 The modular design of an IntelliFinishing system allows for easily expandable floor plan. As your company grows, your production levels change. 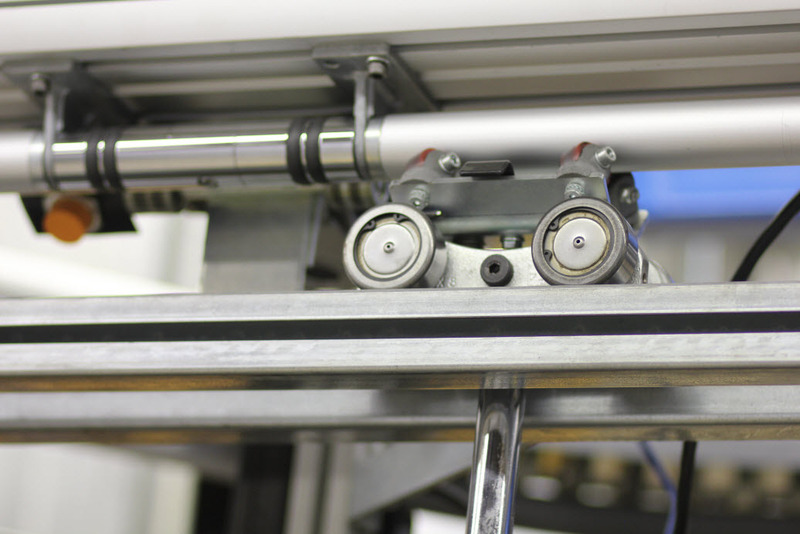 Our turnkey finishing systems grow with you and additional processes or applications can be installed quickly. Call us. There’s not a better time of year to think about a new complete finishing system. 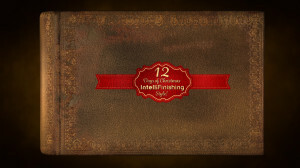 Peek through the pages of the 12 Days of Christmas IntelliFinishing style to see all the benefits and advantages of choosing our alternative to power and free system. The IntelliFinishing system starts with a lift, which is basically an elevator-style, drop section. The orange pieces of the conveyor will come down to a lower height making it more ergonomic for connecting the parts to the carrier. Then it will rise back up after the part information is loaded and send the carrier into the system. The control stations will have a touch screen monitor that will display different part information. The uninstalled load bars are the mechanical pieces that support picture frame style hangers that will in turn support the customer parts. The metal trolleys are the load trolleys that support the weight of the entire piece. The rubber wheels on the top contact our spinning tube and provide the propulsion for the conveyer system. It is a friction setup with a spring tension pressing against the tube. The IntelliFinishing system is unique as it goes forward and reverse directions. This typical configuration is capable of supporting 3,000 pounds, including the weight of the load bar. From the elevator-style lift section we proceed downstream towards a manual wash booth area. In this instance, we’re interfacing to a customer provided wash booth. We are going to control the doors that will slide open and closed pneumatically. Internally the wash booth will be similar to a manual car wash bay. The operator will select a cleaner rinse, a phosphate rinse and a sealer to keep the parts from flash rusting. From the wash bay we head to the small drip zone. Currently this is a manual pull through section, which the customer requested for Phase 1. In Phase 2 we will add an automated wash parallel to this section. At that time most of the parts will go through the automated wash so in the future, less volume will run on the pull through section. Parts will then be pulled to the first motorized section after the wash booth to air blow off. The air blow off is also similar to a car wash system with nozzles and large, electrically powered air blowers. The nozzles will be directed at the parts to dry off any of the residual water. After the blow off area is a dry off oven. This oven is a little smaller, holding one carrier at a time. The oven is used to help boil off any leftover residual water that was not taken care of in the air blow off stage. It also helps to preheat the part, getting it ready prior to powder coating. We head out of the dry off oven and around the corner to the powder coat booth. This is a manually applied powder station at this time. They will have several operators, one on each side, applying the powder coat to the parts. Monitors will also let the operators know what color they are supposed to be painting and what is coming up next. The last station is the cure oven. This is a 450° powder oven. It has 3 motor stations and will be able to hold 3-4 carriers worth of parts at a time. When the units are finished curing, they come out to a several storage areas to give them time to cool. Since our system is an oval it then brings us back to the beginning. This is the backside of the lift elevator section we saw at the start.